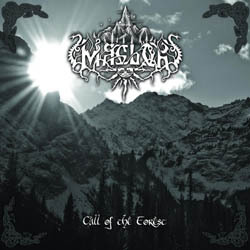 Maglor is a melodic epic black metal band from Calgary in Canada. They were formed back in 2002 and after various changes the band now consists of Draendil, Luthien, and Beren Tol Galen. They never released anything so far, but finally they decided to make the big step. So in 201o they started composing their first full length album “Call of the Forest” that was released on June 2012 via Sounds of the Land Records. There are 6 songs in the album, which begins with the short atmospheric ritualistic intro “The Meeting of Land and Water” putting the listener at once in the right mood. There is also another short instrumental song in the middle of the album, so there are actually only 4 “main” songs. Don’t be afraid though, since the four “main” songs are quite long; 3 of them last over 11 minutes each, so the album’s total duration is a little more than 50 minutes. Maglor play underground epic melodic black metal, with a lot of synths and all 3 members play keyboards! They never become symphonic or majestic though, since they mostly use keys in order to build an epic background in their songs and sometimes just to give them a folk “color”. There are also many orchestral parts, where the band becomes even more melodic and atmospheric. Their guitars have both rhythmic and leading role, with an epic melancholic touch in their sound. Drums and folk instruments on the other hand, don’t sound too natural, but this is something I believe the band can improve in the future. Their songs move in slow to mid tempo rhythms and their vocals are mostly extreme black metal screams that make a beautiful contrast with their melodic music. They also use clean male and female vocals and chants / choirs, adding a lot to the diversity of their songs. Their lyrics are in English dealing with epic old legends, as well as pagan and nature related themes. Maybe it took them 10 years, but Maglor have finally released a very good debut. They only have to improve their sound in my opinion and they can become much better. Fans of underground epic pagan black metal should give them a chance. Except for the logo that was designed by Kogaion Art, all other artwork and photography is made by the band. “Call of the Forest” is released in a 3 panel digipak edition via independent label Sounds of the Land Records and in the following links you can listen to their music and buy their album if you wish.